"IF I WERE..." is an unscripted docu-series that deals with controversial issues such as race relations, sexual orientation, socioeconomic issues, and immigration laws. Atlanta, GA, February 15, 2019 --(PR.com)-- "Dark skin black women are at the bottom of the totem pole. I hate white people. I am HIV positive and if I was straight, this would not have happened," statements taken from Episodes of "IF I WERE..."
IF I WERE... provides a behind the scenes look into the inner workings of the minds of real average Americans. Filmed in man on the street styled interviews, IF I WERE... explores the option of, "Is the Grass Really Greener on the Other Side?" 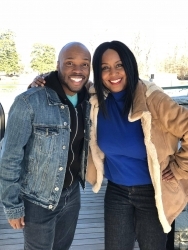 Co-Created and Co-Executive Produced by Media Personality and Author, Kimberly D. Worthy, alongside Actor Chris Noel, each episode delves into a different aspect of societal stereotypes that are unknowingly harbored and often taken for truth. The episodes conclude with several perspectives being given on one topic with the intent to equip viewers to have a dialogue on the topic of "IF I WERE..."
"In today's climate with Race Relations and Gender Inequality being at an all time high, a show like IF I WERE... is desperately needed. Many times in society, I often hear people say, we need to fix the problem! Well, the problem with that statement is, many people are unaware that there is a problem. That is where IF I WERE... steps in. It opens your eyes to what life is like for the next man or woman who may not look or think like you," stated "If I WERE..." Co-Creator, Kimberly D. Worthy. "I am a proud black gay male! I know what it is like to navigate through a society that was not designed for you. From Marriage Rights all the way to Civil Rights. With that being the case, I made an effort to not see myself as a victim but as a survivor. Unfortunately, there are others just like me who feel the exact opposite. This show for me is personal," commented "If I WERE..." Co-Creator, Chris Noel. Full Episodes of IF I WERE... can be seen on its Facebook Fan page: @theifiwere and Instagram Page: @theifiwere. Kimberly D. Worthy is the C.E.O. of Denise S'llure Publishing Company, LLC. She is a Media Personality, Author, Actress and Television Producer. She is the Author of the Educational Children Book Volumes of "Poetry Is Not Just Rhyming" which were endorsed by Hip Hop Mogul, "Master P." Kimberly also Created and Executive Produced the Children Show "Poetry and Life." Kimberly D. Worthy is widely known as a Reality Star on the FOOD Network and Commentator on TMZ LIVE. Chris Noel is the Owner of 1154 Studios. He is also an Actor, Graphic Designer and Videographer. 1154 Studios, creates Brand Identities for Apparel Companies, Schools, Restaurants, and Non-Profits to name a few. Chris Noel is also a Casting Director specializing in Live Events.